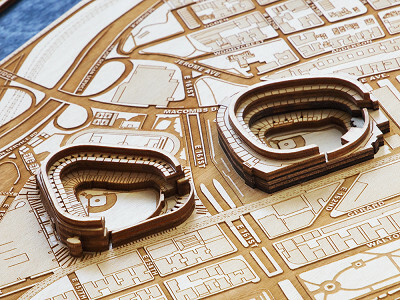 Zach Holt decided to push the creative limits of a laser etching machine by making artful 3D stadium maps that celebrate sports arenas—professional and college—and their fans. 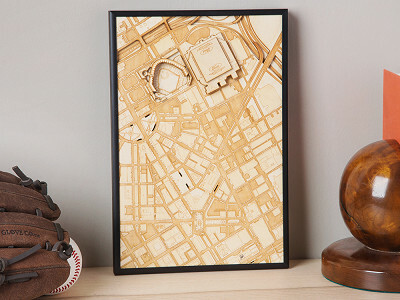 The Made in the USA pieces from Stadium Map Art capture details of not only some of the most famous stadiums in the country, but also the elements of the surrounding area, too. Landmarks like rivers, buildings, and streets help create a bigger picture, and make for an eye-catching map. The process starts with satellite pictures that Zach then zooms in on to capture the details of each stadium and its neighborhood. He creates a digital drawing of each image, laser cuts the pieces in Baltic birch plywood, and then assembles the layered three-dimensional bird’s-eye view by hand. The natural, attractive finish is an elegant way to show off your allegiance to a favorite team. Hello everyone! 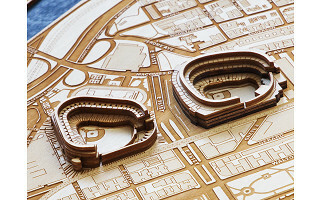 I'm proud to introduce Stadium Map Art to The Grommet. I'd be happy to answer any questions you may have! @nicole You sure can! There are two drop down menus on the Laser Cut Stadium State Map item; so you choose your state and then in then in other drop down menu you choose your city. Michigan... Ann Arbor... Thanks! @Zach Thanks! How long does it usually take to receive it after the order is placed? @nicole No problem! Its 5 days or less to get it in the mail, and then a few days to ship depending on carrier and location. On average, I'd say 5 days total. @Nicole Typically it won't take very long, around the shipping time Zach mentioned, but we state on this product about 10-14 days for delivery. That gives Zach and his crew time to craft the piece for you, and the carrier time to get it to you, plus a little buffer time on the off chance anything should get delayed (much as we try our best, nobody's perfect!). Typically, you'll see it arrive much faster than that stated time, however. Hi Zach. These stadiums look amazing. Which map is your favorite? @Ben Speaking strictly from an atheistic point of view and not necessarily a specific team affiliation; I really like the New York Stadium Map. It has a great balance of water and land, the stadiums are iconic, and the sweeping curves of the railroads and highways provide a striking contrast to the angularity of the roads and buildings. Its just really cool. If you have had a chance to look around, do you have a favorite? @Zach those city maps are pretty amazing! And even though I can't really say I am a Yankee fan - the map is pretty rad. @Ben what is the process for creating one of these city maps? @Ben We take the satellite images and zoom way in to capture the detail, copy that image into Corel draw, and then redraw EVERYTHING. All the roads, buildings, sidewalks, everything that is translated to the wood are individual lines that are drawn. It is very time-consuming but the end results are worth it. @patrick We actually do have the Giants. If you select New York, it is listed there. The stadium, as you probably know, is actually in New Jersey so its a bit of an odd ball. Thanks! @Patrick As far as cost goes, the State Maps are all $125, while the City Maps range from $125-$185, depending on the design. Are you limited to stadiums in the United States or can you also do European locations? @Elizabeth I have dreams and aspirations of doing all stadiums :) I will be starting some football (soccer) stadiums hopefully in the near future. @Amne We do have Gillette Stadium available! Just select Massachusetts as your State and New England (Patriots) from the drop down menu here. @Mike Can you do the city map? @Amne Sadly we don't have a Foxboro or Boston City Map! Much as I'd love one, as a Boston sports fan myself. We'll pass the interest along to Zach and have him add it to his list. I don't see my city/state/stadium listed. How does one go about ordering one not on your list? And, then, any details (turnaround time, pricing, shipping, etc.) thank you very kindly. @Julie You can shoot me an email, [email protected] and Ill add you to the list :) I will do them in the order of most popular :) Thanks! @Zach I'll be glad to shoot you an email. In the meantime: Busch Stadium - St. Louis. City map. Thanks. I would love to order the city stadium map for the Dodgers however I only see that option under state. Will that possibly be available in the future? @christopher I draw the city maps from the satellite images and right now it is just a big pile of dirt :) As soon as Google quits screwing around and updates their maps, Ill add it. @Zach Great! the Pistons will be sharing the new arena with the Red Wings, all stadiums will be adjacent to each other, so it will be a LONG time before you'll have to change it again. I'll put it on my wish list and check back. THANK YOU! Why aren't Baltimore Ravens and Orioles city maps available? For the city maps, do you have Citi Field available (METS)? If not, will you soon? @Bruce We do have Citi Field available! Just select New York as your State and New York (Mets) as your City from the dropdown menus here. I see you have the State Florida and City Gainesville. Any plans on doing an enlarged Gainesville one? It would look great as the baseball stadium, O-Dome (basketball), and Football stadium are all on 1 street and very prominent. Thanks! @Marcie The state shape version of one is actually currently in the works. It will be available soon. Hey Zach, I wanted to point out that the Dallas Cowboys' Stadium is in Arlington, TX not Dallas. It is physically located very near the Rangers stadium. Hello, any plans to add Madison, WI and/or Camp Randall anytime soon? @Jason We are actually currently working on the Badgers right now. It will be available very soon. @Kaye We do have Lambeau Field! Just select Wisconsin and Green Bay (Packers) from the dropdown menus here. Zach actually mentioned above, he works off of Google satellite imagery to create the designs, and currently the satellite photo of the new Red Wings and Pistons arena is just a pile of dirt! Once that photo is updated, he'll be able to work up a design. Beautiful. Now I only wish that the satellite imagery you need were available historically. I'd like a map with Fenway Park in 1954, or maybe for Ted William's farewell in 1960. Or Ebbets Field on June 15, 1938. -- I know my longing is not a practical one, and wish you the best anyway -- but there it is: baseball is a historical game. Zach, these are way cool -- but I don't see Nebraska - where are the Huskers? @Chris I actually do have the Huskers, but they got lost in the shuffle. Poor guys :) We will update and have it available very soon. And Ill add Kansas city to the TODO list :) Its always much cooler when the stadiums are close to each other. @Zach You are terrific. Christmas here we come! I see the state map with fenway park... is there just a city (of boston) with fenway park? @brian Unfortunately, we don't have a city map for Fenway, currently we just have the list that's up on the site now. The city maps are far more time consuming to draw and design, so there are far fewer options. We'll make sure to let Zach know you're interested and add Boston to the list of future designs! These look amazing! Hope you will add a Denver city map soon. @Diane Sorry about the blank response :/ We actually do have Navy available. Go to the Laser Cut Stadium State Map item, select Maryland in the first drop down and then Annapolis in the second. These are good, but they would be better if you included the stadium (Boone Pickens Field) at Oklahoma State in Stillwater, Oklahoma. OU is not the only stadium in Oklahoma. @Frances We'll let Zach know to add to his list of potential new designs! Hi, Zach! I'm interested in a city map for Pittsburgh that would include at least Heinz Field and PNC Park but ideally also include PPG Paints Arena. I know that's not currently an offering for the city maps. Is it possible? 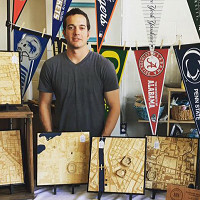 @Bob Unfortunately we only have available what's shown on the City Maps product page - the City Maps take a ton of hours to create, but we'll let Zach know to add Pittsburgh to his list! @Bob - I am currently working on Pittsburgh...unfortunately the Penguins stadium is too far west to be included :( It is 12x18 vertically, like the Cleveland map. Should be available in a few weeks. Thanks!! I see you have Wrigley Field in the state map but do you also have it available as a city map? @Tracy We'll let Zach know to add it to his list! Currently we only have the cities listed on the product page available. Is there any chance you would do University of Tennessee Neyland Stadium? It would make a great Christmas present! Thanks. @Judith We don't have Neyland available at the moment, but we'll let Zach and his crew know to consider creating a design for it! Youi might double down by producing the best golf holes in the world, like #14 at Pebble Beach.